Every time I read this book to my girls, this page never fails to bring tears to my eyes and a lump in my throat. The look on Jesus’ face as he runs towards his lamb stirs intense emotions deep within my heart. I hate that word. I hate it with every fiber of my being. I hate that we live in a broken world where free will and sin and evil leave innocent children without their families. I hate that there are children languishing in institutions all over the world because the very foundation of which every other relationship is formed, was ripped out from underneath them. I hate that not enough people are angered by the fact that there are 140 million orphans in the world. 140 million. I hate that people are numb to that statistic because it’s overwhelming and it feels like nothing can ever change it. I hate that because the number is so large, it’s easy to look at it as just a statistic instead of a child. I hate that there are 140 million faces waiting for someone to claim them as family. I hate that for the majority of them, they will never exchange their title orphan for son/daughter. I hate that Our Little Sparrow is passing her days not knowing that she has a family half way around the world, who prays for her every single day. I hate that she has no idea that she is deeply loved and treasured and we eagerly anticipate the day we can embrace her in our family hug. I hate that human inefficiency and governmental bureaucracy delay the adoption process longer than necessary. I hate that there are questions to which my girls will never find the answers. I hate that for the rest of their lives, in spite of being redeemed through adoption, there will always be a deeply imbedded wound of profound loss. I hate that a part of their identity will never be known. I hate that there is a crisis so devastating that “Orphan Sunday” needs to exist. And so when I turn to this page in the book and I see the look on Jesus’ face, I am reminded of his indescribable love for each of us. 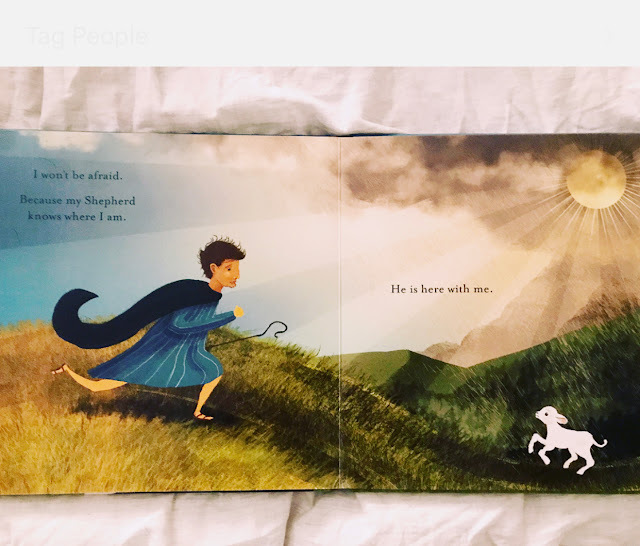 He RUNS to his lamb. He tells us that he will not leave us as orphans, he will come to us. He sets the lonely in families and his plan is to give hope and a future. He tells us to speak up for those who can’t speak for themselves and to defend the weak and the fatherless. Every morning, I wake up to three precious faces. Faces that radiate joy, love, and a confidence from knowing they are daughters and sisters; we are a family. Faces that used to project dull, lifeless, and empty stares. Through my daughters, I have been given a priceless gift - the gift of seeing first hand the transformation that has taken place in each of them. In return, I will fight and advocate with all that I have for those who have nothing.